Phanteks Halos Lux 120mm Frame, RGB-LED - Aluminium, black Black fan frames, premium aluminium, for 120 mm fans, with 18 integrated RGB-LEDs, high compatibility Phanteks stands for innovation, quality and distinctiveness. Phanteks embarked on this mission with their fantastic cases, coolers and fans. The Halos Lux represents Phanteks taking the next step in terms of innovation by offering RGB illuminated frames for upgrading fans. This enables even standard RGB-less fans to look great without compromising on performance. The premium Phanteks Halos Lux are fan frames with RGB lighting which can be mounted to standard 120 mm fans. Manufactured in robust, anodised, black aluminium, even without lighting they have an incredible look. With the 18 integrated RGB diodes they allow any gaming PC to be quickly and easily supplemented with an impressive lighting upgrade. 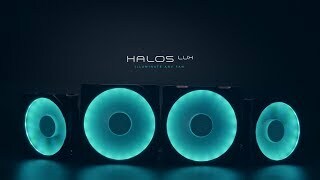 The Halos Lux can be controlled through Phanteks' integrated RGB controls. The bundled RGB-LED adapter can also be integrated with the motherboard, offering support for MSI Mystic Light, ASUS Aura Sync and Gigabyte RGB Fusion. A diffuser ensures a bright and even distribution of light to allow your case and fans to achieve the best possible lighting. Especially exciting is the possibility to daisy-chain several Phanteks RGB products together. The Halos Lux can also be integrated into such a setup. More links for "Halos Lux 120mm RGB LED Fan Frame - Aluminium Black"
Black fan frames, premium aluminium, for 140 mm fans, with 21 integrated RGB-LEDs, high compatibility.